As of the 1st of April 2005 building regulations state that any new or replacement Oil boiler needs to be a condensing boiler. Only in exceptional circumstances does this not apply. A condensing oil boiler is a boiler that re-uses previously wasted heat from flue exhaust gases. They will have a bigger heat exchanger or an additional heat exchanger, which allows the water in the water jacket to extract more heat from the exhaust gases than non-condensing boilers. 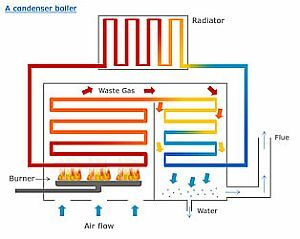 As the water vapour cools it turns into water (condenses) and leaves the boiler via a condense pipe (and trap) to a suitable termination point. Condense water is slightly acidic, between 3-5 PH and thus would ‘rot’ ‘old fashioned’ boilers heat exchangers. Condensing boilers are generally made of stainless steel to prevent this. Whilst not great, the slightly acidic nature of the water is no worse than a lot of fizzy drinks. This entry is filed under Boiler Care and tagged boiler, heating.